Yesterday’s trading day turned out quite unusual for the EUR/USD pair. Before the release of US market data, the trade proceeded steadily and calmly. However, once the afternoon data came in, the volatility on the market increased substantially. Eventually, the price of the pair went up slightly from its previous level of 1.0858, and ended up at 1.0900. Ambiguous data from the US somewhat confused the traders, which led to rapid price changes during the second half of the trading day. Still, it is too early to draw conclusions, as employment data is due this Friday, which will ultimately dot the i’s and cross the t’s. No substantial news from the European market is coming today. However, the data on continued jobless claims from the US is expected this afternoon. The ratio will probably continue to ascend towards the 1.1050 mark. During the last trading session, the GBP/USD pair went up slightly. After a short-lived slump into the 1.5540 zone, the pair saw an upswing to the level of 1.5640, but at the end of the day, the ratio settled only at the 1.56 mark. Today will be one of those days with bulk volumes of GBP/USD trade. Data from the British market will be coming in throughout the day, with the interest rate of Bank of England being a key piece of anticipated information. There is little chance the rate will change, but the sheer amount of news will keep the trading day interesting. The trend may be furthered by data from the US this afternoon. Yesterday was a successful day for the pair. The trade was intense, but due to favorable circumstances, the USD/JPY pair temporarily visited the 124.00 mark and, at the end of the day, landed at 125.00. The pair came close to the resistance level of 125.60, although we didn’t see the data that would push for such an upswing. No data from Europe except for the flood of British news is expected today, but the numbers for continued jobless claims should bolster the trade. Yesterday’s trading day ended up being a steady one for the pair. The two enjoyed the sideways drift without substantial fluctuation in price. News from the New Zealand market did not affect the quotation situation, thus, the trade was governed by the news from the US. A lot of data from the Australian market is expected this morning, including employment and unemployment rates, as well as labor force participation rate. US market news is expected in the noon, which should adjust the trading behavior of the pair. The last trading session was not too eventful for gold. Although it did attempt to leave the 1084 level, by the end of the day, it ended up where it started. Gold trade will stay in the sideways market, and only the coming Friday will give some insight into the next month. Gold is aiming to reach 1050, and later — 950. From this Thursday, the monthly rate decision and the minutes of the Bank’s Monetary Policy Committee (MPC) meeting will be released together, without the normal fortnightly gap. Both news are key indicators for the whole economy, therefore many tend to consider that this decision might cause information overload. Every three months Super Thursday will also coincide with the release of the Bank’s quarterly inflation report. Mark Carney, the Bank of England governor, says bringing these three announcements together will “enhance our transparency and make us more accountable to the British people”. 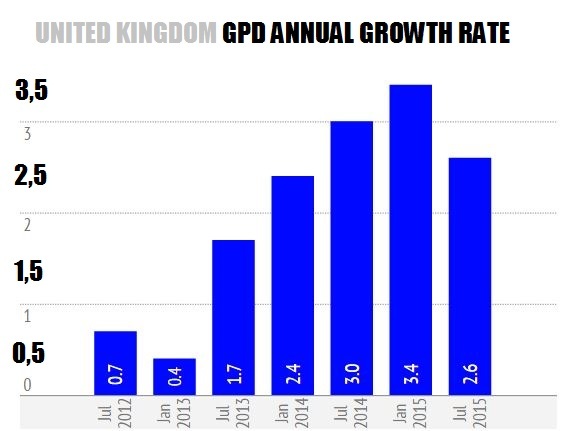 Meanwhile, GPD in the United Kingdom expanded 2.60 percent in the second quarter of 2015. GDP Annual Growth Rate in the United Kingdom averaged 2.46 percent from 1956 until 2015, reaching an all time high of 9.80 percent in the first quarter of 1973 and a record low of -5.80 percent in the first quarter of 2009. GDP Annual Growth Rate in the United Kingdom is reported by the Office for National Statistics. Major Japanese firms plan to increase domestic capital spending by 13.9 percent according to the latest survey by the Development Bank of Japan. The fourth straight year of increase is led by manufacturers with brisk earnings partly thanks to the yen’s weakening. In particular, greater spending is eyed for developing new and higher-functioning products in growth fields such as materials and parts for fuel-efficient vehicles, smartphones and aircraft. According to the survey, manufacturers plan to boost their capital expenditures by 24.2 percent. Capital investment is projected to surge 61.3 percent in the electric machinery sector, the first increase in five years, amid strong demand for semiconductors and displays for smartphones and in-car devices. Projects to newly set up data centers for cloud services also contributed to the growth. The auto industry plans to spend 25.7 percent more on facilities and equipment. 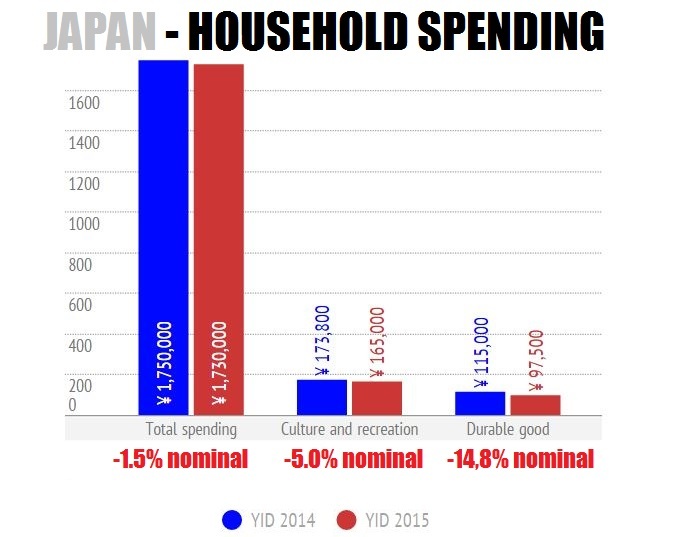 Meanwhile, household spending fell 1.5% in nominal terms and 2% in real terms (benefiting, ironically, from the low “inflation” figures): culture and recreation spending fell 5.0% and durable goods fell 14.8%.